Just like cars, we run on fuel. For us, that fuel is food and water. It is easy enough for us to know our car needs gasoline and not dishwasher soap. So, why is it so difficult for us to understand that we need nutritious whole foods and not cheeseburgers, sodas, and donuts? The reality is that this is not our fault. Our bodies are not flawed. This is not a problem resulting from defective genes, inability to control portions, or a propensity to emotionally eat. Instead, the problem lies with the environment we currently live in. We are inherently hard-wired to enjoy pleasurable experiences, which served as a very useful survival mechanism for our ancestors. In order for our ancestors to survive in nature, they needed to learn how to find food without becoming food. The most efficient way to do this was to find the foods with the most calories (providing the most pleasure). For example, if they had a choice between a banana and a cucumber, they were programmed to choose the banana. Why was this a useful survival tool? Because it was the more efficient fuel source. Let’s say we need about 2000 calories worth of fuel a day. That would mean eating either about 20 bananas or about 45 cucumbers. By being drawn to (deriving more pleasure from) the banana, our ancestors would get the most bang for their buck. They would have to work less to get the right amount of calories, and by saving time, they would limit their exposure to outdoor danger. So, the banana became a win-win choice. Unfortunately, the advancements in our environment have created new scenarios for us. We are no longer choosing between a banana and a cucumber; instead, we are choosing between a banana and a cheeseburger. And, using the same algorithm, it now becomes more understandable why we choose the cheeseburger. Okay, so now we understand why we make certain food choices, but what does this have to do with experiencing pleasure beyond that of food tasting good, and how does it actually harm us? When we experience pleasure, a neurotransmitter called dopamine is released in our brain. This happens with any pleasurable experience, from falling in love, to being intimate, to winning the lottery, to eating an ice cream sundae. The release of dopamine is what we then interpret as pleasure and what propels us into a dopamine-pleasure cycle. During the dopamine-pleasure cycle we release dopamine, we feel good, we continue doing the action that will release dopamine, and we continue to feel pleasure. Through pleasure reinforcement, this mechanism ensures that we continue to repeat those behaviors that are necessary for our survival; for example eating and reproducing. But, those are not the only activities that release dopamine in our brain. In fact, over time we have learned how to manipulate this system with cocaine, heroin and, unknowingly, with our favorite fast food version of a heart attack on a plate. So, we can begin to see that a system that may have worked for our ancestors (who didn’t have fast food restaurants and drugs so readily available) may not work so well for us. Let’s explore this a little more. We want to feel good; who wouldn’t? In fact, up until the last 100 years or so, whatever made us feel good was generally in our evolutionary best interest. So, as we discussed above, it is in our nature to turn to those things that will give us pleasure, one of which is the food we eat. The problem is that the more calorie-dense the food (i.e. the more calories in one pound of a given food), the more dopamine is released. Again, this works well for ensuring our survival. Given a choice of a cucumber or a banana, our ancestors were encouraged to choose the banana because it was dangerous (possibly life-threatening) for them to go out and get food. In addition, food was not as readily available and storing extra calories for “rainy days” was a reality and often a necessity for survival. In today’s world, with no saber tooth tiger lurking in the shadows and with fast food restaurants and convenience stores at every corner, we no longer share those same concerns. But our body is still programmed to seek out caloric density. 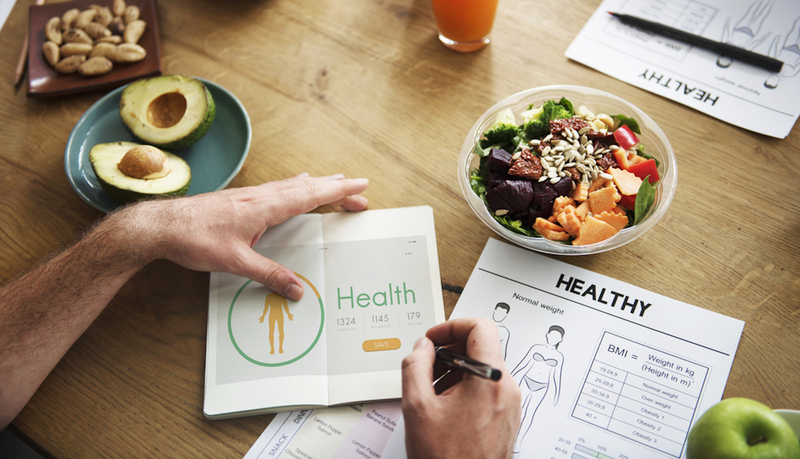 What our body doesn’t realize is that we are no longer only choosing from whole foods; rather, many of us rely on fast foods or processed/packaged foods for breakfast, lunch, and dinner or some combination thereof. So, why is that a problem, you may ask? Beyond the host of health related issues associated with added sugars, salts, and fats found in processed and packaged foods, there is the issue of significantly increased calorie density in these types of more processed foods. Our stomach responds to two things: stretch and calories. Based on this information, we have a built-in system that assesses how many calories we take in on any given day. This system is very accurate as long as we are eating natural whole foods, our “calorie currency” per se. But, when we introduce fast food and junk food into our bodies, our system goes haywire. This is primarily because when manufacturers process food, they remove water and fiber along with other nutrients, which concentrates calories so that the stretch of the stomach and calorie density no longer correlate. The average “500-calorie meal” consumed 100’s of years ago stretched the stomach much more than a present day “500-calorie meal.” For example, if you eat 500 calories of potatoes your stomach will be stretched significantly, and as a result you will feel full. However, if you eat 500 calories of bacon or 500 calories of chocolate, both devoid of fiber and water and full of added fat and sugar, they do not fill up your stomach and you will continue to feel hungry. Your body will be confused into believing it has not consumed enough calories, and it will instruct you to eat more. You cannot fight this survival instinct, just as you cannot breathe five times per minute for an extended period of time if your brain says you need ten breaths per minute. So, you eat to not feel hungry (eating until your stomach stretches enough), but by the end of the meal you have consumed many more calories than your body actually needed. Over time, this results in weight gain. 3500 additional calories equals one additional pound of fat. To make matters worse, we develop a dependence as well as a tolerance to this higher “dopamine hit.” Without even realizing it, we begin to rely on these foods to make us feel a certain way. There is a reason why we seek out pizza and brownies (higher calorie density and more dopamine released) and not cauliflower and wheatgrass (lower calorie density and less dopamine released) when we are feeling stressed or depressed. We are in fact drugging ourselves with the foods we eat (choosing more calorie-dense foods that stimulate pleasure through a higher dopamine release). And, like addicts (which, in fact, is what we have unknowingly become) over time we develop tolerance, eventually seeking a greater high, which leads us to eat even more of these processed fatty foods. The good news is that once you understand calorie density you can easily calculate the number (divide the number of grams per serving into 454g and then multiply that by the calories per serving to get the calories per pound of that food or dish) and try to keep your average diet in the ballpark of that number. We know that an ideal calorie density to average is in the neighborhood of 550 calories per pound. That doesn’t mean every food or meal needs to be that calorie density, rather we just need to average that over the course of our days and weeks. 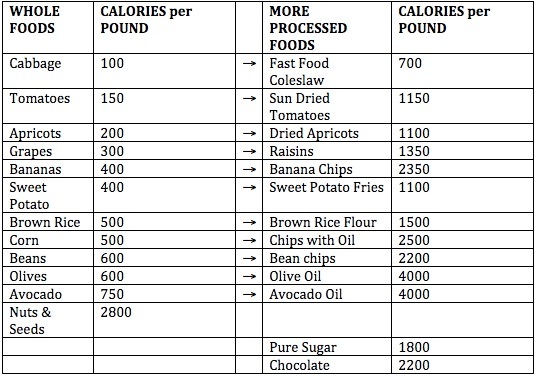 So if one food is higher in calorie density then try to balance that out with a food lower in calorie density. Also know that if you are eating low calorie density foods then you can eat until satisfied and full without over-consuming calories. However, if you are eating a high calorie density dish (i.e. a rich cashew cheese lasagna or nut-based dessert), then you know you should not fill up solely on that dish (unless you have higher caloric needs). That is where 3-phase eating comes in nicely (see previous article on this topic linked here), as this simple process allows you to easily maintain the calorie density of your meals where most people need it to be. Ultimately by following the principles of 3-phase eating and calorie density you will finally be able to eat until satisfied, whenever you want, and remain trim and healthy!